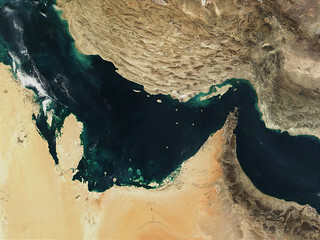 Description: In the Persian Gulf, two tectonic plates-rigid pieces of the Earth's crust-are colliding; the Arabian plate (lower left) is running up on the Eurasian plate (upper right). At lower left in the MODIS image is the younger Arabian plate, and it is moving northward to collide with the Eurasian plate. The Persian Gulf (top) and the Gulf of Oman (bottom) were once the site of a rift, a place where two plates pull apart from each other, and the Indian Ocean filled in the widening gap between the two plates; however, the process then reversed, and about 20 million years ago, the gulf began to close up. The collision of the two continental plates gives Iran its mountainous terrain. This image was made from data acquired on December 30, 2001.